Using dozens of practical examples from the worlds of business, politics, science, sports, literature, even parenting, esteemed economist John Kay makes an argument that feels at once paradoxical and deeply commonsensical: The best way to achieve any complex or broadly defined goal — from happiness to wealth to profit to preventing forest fires — is the indirect way. In the decades after World War II, Boeing had one overriding purpose: to make the best, most advanced planes. In the words of Bill Allen, Boeing CEO from 1946 to 1968, the purpose of Boeing was to "eat, breathe and sleep the world of aeronautics." By the early 1990s, Boeing was the world’s dominant civil aviation company. Under new CEO Phil Condit, however, the goal of the company changed dramatically. Success was now defined in terms of profits, not aviation. "We are going into a value based environment where unit cost, return on investment, shareholder return are the measures by which you’ll be judged," Condit explained. "That’s a big shift." In the years that followed, Boeing lost its lead in civil aviation to rival Airbus, the stock market turned sour on the company and, in 2003, Condit was forced out. Boeing returned to aeronautics and aviation goals, and, with the success of the new 777 and with the groundbreaking Dreamliner on the horizon, the company was soon putting itself once again in position to dominate the world aviation industry. In short, when Boeing focused on aviation, it was a profitable and successful company. When it focused solely on financial measures, its bottom line suffered. Why are companies who have the No. 1 goal of making profits often unprofitable? And why, paradoxically, are companies who have different, more qualitative goals often quite profitable? 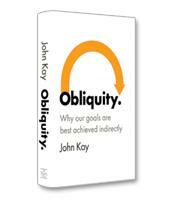 The answer, writes London School of Economics professor John Kay in his new book, Obliquity, is simply stated: broadly defined or complex goals are best achieved indirectly — a phenomenon that Kay terms "obliquity." For example, in the same way that the most profitable companies are not those whose goal is to pursue profit, the wealthiest individuals are mostly those who are less interested in pursuing wealth. Their wealth is a byproduct of a different mission. Henry Ford was passionate about cars and bringing cars to a mass market. Sam Walton wanted to build the world’s best retail company. Bill Gates was fascinated by the potential of computing to change people’s lives. Their No. 1 mission was not to become rich — although they all amassed fortunes. Obliquity is not an argument that goals are useless — that you never reach what you strive for. Instead, Kay explains, obliquity is the recognition that we cannot plan and control every step of a path toward a complex goal. Broad, complex objectives are achieved through a process of risk-taking, experimentation and discovery, a continuous circle of learning and adaptation. The direct approach doesn’t work, Kay writes, for a variety of reasons. One reason is what he terms "pluralism." There is often more than one answer to a problem. Also, most real-life, high-level objectives problems are broadly defined and can’t be broken down in advance into specific goals or actions. There are many paths to building a successful business or even becoming financially secure. A third issue with the pre-planned, direct approach is the unpredictability of interactions with others. Will others react as we plan for them to react? Probably not. In the final section of the book, Kay lays out some of the ways we can use the concept of obliquity to make better decisions and to solve problems more effectively. For example, make a determined commitment to overall high-level objectives, but do not stubbornly cling to specific intermediate or basic goals or actions. Franklin D. Roosevelt achieved two major objectives: preparing for and leading his country to victory in World War II, and securing the survival of American capitalism through the New Deal. He achieved those high-level objectives, Kay writes, "through pragmatic improvisions in the face of circumstances that neither he nor his outstanding advisers could predict or control." Another application of the concept of obliquity is to admit that we cannot know everything about a situation. Both Warren Buffett and George Soros are legendary investors, but both acknowledge that they cannot plan for investment success. "In many industries," writes Buffett, "I cannot be sure if we are dealing with a ‘pet rock’ or a ‘Barbie.’"
Intellectually stimulating and filled with vivid, pertinent examples, Obliquity is a thoughtful analysis of how the world truly operates.